It seems just like yesterday that Tom Brady was hoisting his sixth Super Bowl Trophy! No your eyes are not deceiving you and we are not crazy. What it really seems like is that Tom actually did hoist his sixth Super Bowl trophy. Philadelphia is a great sports town with long enduring and above and beyond great fans. The Eagles got the praise and accolades in which they deserved; in Philadelphia. But what about around the country? Have the Eagle received their just due? No, they have not, they were the best team in football and nobody outside of Philly is talking about them. Everybody is talking about the Patriots chances to repeat as the AFC Champion. The Patriots are who they are and whether you love them or hate them, and as long as Tom and Bill are in town, they will be the center of conversation in the AFC. Can they really repeat, are they that good? Absolutely and that is exactly why they are the favorites to win Super Bowl LIII. It is highly unlikely that any quarterback will ever come along, at least not in our lifetimes, and wrack up 5 Super Bowl victories. With today’s competition, the odds of this happening are tantamount to insurmountable. It’s safe to say 5 is safe! Let’s take it a step further–Joe Montana and Terry Bradshaw both won 4 respectably. Troy Aikman won 3, John Elway played in 5 but only came away with 2 victories. Steve Young gets honorable mention with 3 rings, but one win as a starter. A host of all-time greats racked up SB victories including names such as Peyton, Eli, Big Ben, Staubach, Starr, Plunkett and Griese. There is not one legitimate threat from any active quarterback to even smell four; let alone come close to five! Once again, Las Vegas throws all of its cards on the Patriots and for good reason, who can beat them? Who is out there that has a legitimate shot at beating the Patriots and finally knocking them off.? The Jaguars, Steelers, Chiefs? There is not one team that can be pointed to legitimately and said, “They have a real chance to knock of the Patriots’”. The Broncos are rebuilding, whether Elway wants to admit it or not; they are rebuilding. What about the NFC? There have certainly been some interesting moves so far in the offseason that would have to include Minnesota, the Rams, 49ers, and Certainly the Cowboys. The Cowboys have all the money! Money talks and it buys players. With Ezekiel Elliot back and available for an entire season, they will be a difficult foe. They will be extremely hard to beat when clicking on all cylinders. The Rams will be better with Aquib Talib and Wade Phillips at the helm of what is sure to be a nasty defense. There is no reason to believe that the Eagles will not and cannot be right back in the same position to defend their title. Nobody was better last year and it will be near impossible for any other team to come close. 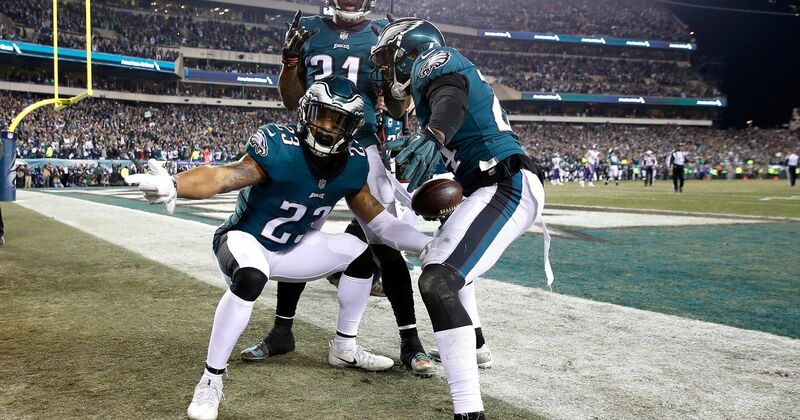 Eagles Return for their second straight Super Bowl. Ravens go back to the Super Bowl. The Eagles are built for the future and they are now proven winners. Tom is Tom but eventually age will catch up with him and the Patriots are in somewhat of a transition mode. They will be good and they will remain hard to beat but they go down in 2019 and Tom will finally hang it up! Stay tuned for more NFL predictions after the NFL Draft. This year’s draft could be a game changer for many teams and don’t expect the Jets to stay at 100/1 for very long. Get your future bets in now, it could pay very big dividends.